Barry Allen. The Fastest Man Alive. 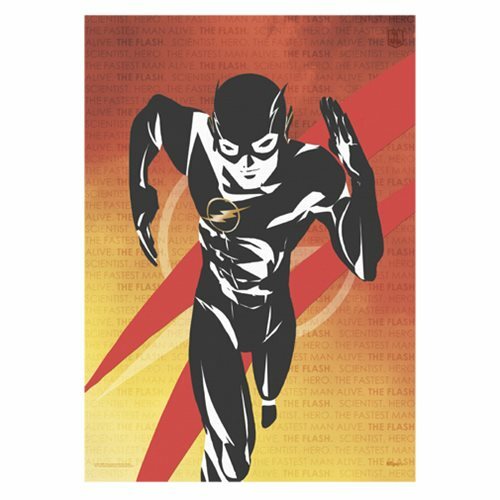 This unframed 24-inch tall x 17-inch wide Justice League The Flash Words MightyPrint Wall Art features the Scarlet Speedster in silhouette style, with a blazing background of some of the words that describe him: "Scientist," "The Fastest Man Alive," "Hero," and "The Flash." The darkness of the minimalistic black silhouette of his DC extended universe-style suit emphasizes his emblematic lightning bolt. What makes MightyPrint wall art so unique? MightyPrints are made to last. Due to the prints' high quality and durability, you won't have the typical difficulties of tearing, fading, or warping. They're vibrant in color, making them a welcome addition to any collection. In addition, MightyPrints are made to diffuse light, bringing the colors to a new level when back lighting is present. Place yours in front of a window or in an LED illuminated light box (sold separately) and be amazed!